Stencil graffiti has found its heart in Melbourne, Australia. No other city boasts such quantity and quality of stencil art. Through intimate interviews, dynamic layouts and a riot of examples the artists are shown in the context of world street art culture. Stencil Graffiti Capital: Melbourne is the first book to explore the city's thought provoking, visually rich stencil graffiti scene. Nearly 500 full colour images document the beauty and breadth of the work produced. Art, interviews and profiles of artists including: Psalm, Phibs, Sixten, Meek, Rone, Prism, Sync, Meggs, Banksy and more make this an essential book for anyone with an interest in street art, design and contemporary popular culture. Have a look inside the book! Carl Nyman is a graphic designer and illustrator. Originally from Sweden, he has lived and worked in Melbourne and currently resides in New York City. Recent work includes a tour of five major Asian cities, bringing stencil graffiti to the Far East. He continually documents urban expressions of art. Melbourne's Jake Smallman has worked as a graphic designer in the United Kingdom and Australia. 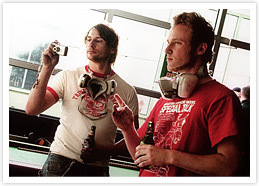 He has documented and participated in Melbourne's stencil graffiti scene for a number of years, gaining media attention and commissions in addition to exhibiting all over Australia and in the United States. Hardcover restock now on special! We've been lucky enough to pick up some stock of the hardcover edition, which is now very hard to find. To celebrate this we're offering a special price of only $35 (previously $55). Order now, while stocks last Here. 2012 - Soft cover version released! 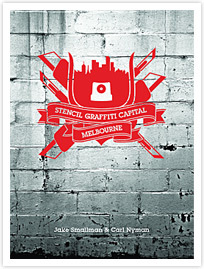 After six years of strong sales, Stencil Graffiti Capital: Melbourne has been released as a soft cover! This edition features all of the original's great photographs and interviews at the same size but lower cost. Order it Here. The one and only Wooster Collective has a short report on the controversial Melbourne exhibition and launch of Stencil Graffiti Capital: Melbourne. Gabriella Coslovich wrote a great story about Melbourne street art and the councils' new zero tolerance stance. Author of Stencil Graffiti Capital: Melbourne, Jake Smallman, was joined by artist Civilian on Radio National's The Deep End to talk about the book. Copyright © 2005 Jake Smallman & Carl Nyman All rights reserved. Website developed by Kamil Gottwald (web developer/graphic designer) 2005.